Our first article on the TSA along with the second article on their waste and abuses and the subsequent ratio interview drew the attention of Becky Akers, free-lance writer and historian and fellow freedom-loving patriot. She was especially heartened to see that we did not specialize in aviation or security as normally objections to horrific actions of the TSA come from these quarters. 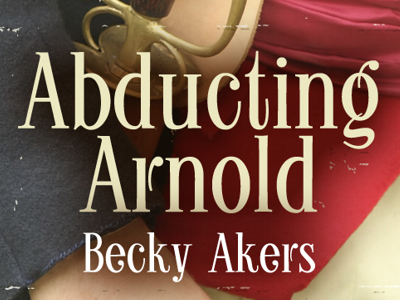 Becky Akers is also the author of two novels set during the American Revolution, Halestorm (about Nathan Hale) and Abducting Arnold (about Benedict Arnold). What authors inspired you to write novels like these? I’ve loved historical fiction since I learned my ABC’s. Among the first books I devoured was an old series called “Dan Frontier.” This American pioneer enjoyed adventures with wagon-trains and Indians, cowboys and wild animals. Dan was an old-fashioned American who never heard the word “can’t” and scoffed at “don’t,” so he utterly captivated me! – and hooked me on history, especially that of early America. I’d practically memorized Gone With The Wind by the time I was twelve; ditto for Light in the Forest and just about anything else by Conrad Richter, Jessamyn West, Gladys Schmidt, Agnes Sligh Turnbull and Ken Roberts were other huge favorites. So many magnificent historical novels were published from the 1930s to the ‘60s; I remember being thankful as a child that I lived now rather than the Middle Ages because those poor serfs didn’t have such treasures as The Friendly Persuasion or Day Must Dawn (which is far better than its title!). Most successful writers say that while everyone wants to write, few are willing to spend the hours learning the craft of writing. They think if it did not come easy they can’t become good. How did you put in the time learning the craft? I would actually agree that if it doesn’t come easy, you’ll probably never shine. You may be adequate, but writing is a talent, like so many other aptitudes. For example, I play piano. I work assiduously at it, but I have little talent. Even if I practice 15 hours every day for the rest of my life, I’ll never come close to the magic of a Van Cliburn or Gould. Still, I practice. And anyone can improve his writing even if he has as little ability as I do. I’ve found that one of the best ways to do so is to read. Voraciously. And notice the style, not just the content. Which authors have you yawning, and which make your eyes sparkle? What is each doing that provokes those reactions? I’ve also studied grammar and languages intently though inadvertently. I took Latin as soon as my public (read: abysmal) school offered it, not because I thought, “Oh, I want to be a writer, and this will teach me grammar and vocabulary,” but because I loved the idea that people 2000 years ago had spoken this language, and I could, too. I added ancient Greek in college because I wanted to understand the basics of Western civilization, but again without intending to, I also gave myself the finest of lessons in vocabulary and grammar. How did you come to write these books? Why Nathan Hale? Why Benedict Arnold? Nathan Hale has fascinated me since I first heard – or read — about him: I was so young, I can’t remember which it was. Good old Dan Frontier had already primed my love of American history (which, as an adult, I came to understand was really a love of the liberty that history had sometimes permitted). So when I learned that a 21-year-old guy had died for that freedom, and with such courage and panache, too, I was hooked. I read everything I could find on him — mostly children’s books. I have yet to understand why a thrilling drama that pits a principled, honest, witty, brilliant and courageous hero against a corrupt empire is confined to kids, but there we are. I finally realized that if I wanted a novel for adults, I would have to write it first. And when I finished work on Halestorm, with all the research that entailed, Nathan intrigued me more than ever! He was truly a stellar human being; I never uncovered anything that diminished my love, respect, and admiration for him, and believe me, I read everything by or about him (there isn’t much since he died so young). How many heroes retain their glow under the microscope? The more I dug into the story of the treason and of Benedict Arnold’s life, the more mesmerizing both became. And the more incensed I grew: Arnold was a huge champion of freedom whom contemporary political enemies slandered. Historians have irresponsibly and unfairly repeated those slanders as fact ever since. What will readers learn in your novels? I also hope to demystify the American Revolution for them. Marxist and statist historians have grossly perverted it – and made it insufferably boring in the process. The Revolution was not a class struggle, nor was it a movement for democracy (which the 18th century correctly abhorred as the tyranny of the mob). It was about people like us and an empire, complete with a suffocating bureaucracy and trigger-happy cops, seeking to subjugate them, just as the American empire hopes to do today. And they reacted as viscerally to this proposed slavery as we should. What do you think Nathan Hale would think about current politics? What common mistake do you see people make in their political thinking? They assume that government is essentially benevolent and beneficial, that we only need honest, upright politicians and bureaucrats to run our lives for us, and voila, paradise. They seldom see the State for what it is: a ravening beast straight from the pit of Hell, seeking whom it may devour. And if the history of the 20th century doesn’t prove government’s wickedness, with the rise of genocidal communist and fascist regimes worldwide, I don’t know what does. This country is fast heading down that same path – and I say that not to be incendiary but because it’s true. I may set my next novel in WWII, so I’m intensively researching the Nazis now. And the parallels and similarities between our times and theirs, between Americans’ attitudes and Germans’, chill me. The vicious beatings brownshirts dealt eerily echo those modern cops dispense; the Nazis forced men to drop trou and prove they weren’t circumcised, just as the TSA humiliates and denudes passengers in airports. I pray the Lord will wake Americans and inspire them to stand against government before the camp’s gates clang shut behind them. Breakfast! So much delicious food, so few meals!